Wondering if your bathroom needs a simple make-over or a total refurbish? While a splash of paint and new accessories can go some way to revive a tired bathroom, some signs show it’s time for a complete overhaul. Dated Bathroom Suites – Lots of bathroom fittings can be tweaked to give a fresh, up-to-date feel, from replacing worn flooring to installing new lighting, however, some features can’t be improved by a quick-fix. Avocado, peach, pink and canary yellow bathroom suites were all the rage in the 1970s and1980s - the louder, the better! 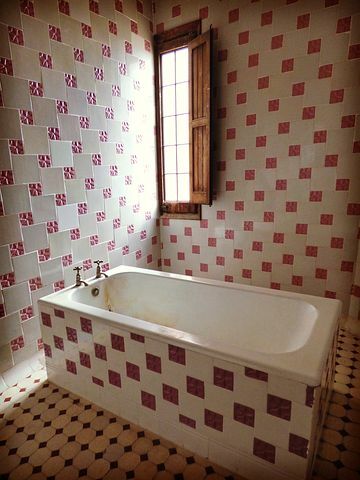 Unless you’re a fan of the retro look, lurid coloured suites are a sure sign your bathroom is past its use-by-date. We have a range of classical bathroom suites and fittings at European Bathrooms, come and browse our Windsor and Amersham showrooms. Is your bathroom a floor-to-ceiling tiling nightmare? Start planning your dream bathroom today with European Bathrooms. Old Fashioned Floor-to-Ceiling Tiling – If your bathroom is covered in dated wall tiles – beige tiles with sprays of orange and brown flowers were a popular 80s motif – then refurbishing is the way forward. While it may be tempting to paint over old and dated tiles, it rarely gives a high quality, durable finish. Furthermore, tiling over existing tiles is only suitable if the walls are in good condition. If there’s hollowness behind the tiles, there is usually a problem with the plaster which will prevent new tiles adhering properly. Placing new floor tiles over old can also block doors, cupboards and require fixtures such as, bath panels and shower trays, to be raised. To achieve the best finish, we recommend removing old tiles and re-skimming the plaster where necessary. Family Upsizing and Downsizing – A shower room or small bathroom may be fine for two but if you’re expecting your first or another baby, it’s time to refurbish. Re-designing and re-modelling not only ensures you get the extra space you crave but will make busy bath times with little ones a dream. Visiting a professional bathroom planner, like our expert designers at European Bathrooms, means you’ll attain the best bathroom layout. For example, our designers can show you whether the space can accommodate a shower cubicle and a bath (a great time-saver if you have children) and where extra storage can go. They can also talk you through the latest bathroom technologies and accessories, so you can create your ideal shower/bath experience. The way you use your bathroom also changes when children fly the nest. If you’ve got more time to yourself, maybe it’s time to turn the family bathroom into a relaxing retreat, complete with freestanding or whirlpool bath? Or start creating that stunning en-suite you’ve always dreamed of? Major Plumbing and Electrical Problems – Older bathrooms are more likely to experience plumbing and electrical problems, some more serious than others. If your bath or sink drains slowly with no obvious blockage, it may mean a broken pipe. Broken pipes can lead to water pooling behind fittings, which can cause mould and leaks. Coloured water also indicates a severe problem with the pipes – red and brown suggests rust, while green and blue signals copper pipe corrosion. Another common issue with older bathrooms is that the wiring needs updating to cope with modern appliances, such as, power showers and extractor fans. As well as dangerous, left unresolved, these hazards can damage your bathroom and adjacent rooms. To put problems right, plumbers and electricians often need to undertake invasive work, removing panels and cutting into walling, floor boards and tiling. If your bathroom is already a sticking point, rather than patch over repair work, seize the opportunity to refurbish. As well as enabling you to get the bathroom design you really want – so you enjoy it every time you use it – a new bathroom will boost your home’s value if you move on in the next few years. To start creating your dream bathroom, book your free at-home or in-house bathroom design appointment online here, or call into our modern Windsor or Amersham bathroom showrooms.